The extinction of species by human activity continues to accelerate, fast enough to eliminate more than half of all species by the end of this century. Earth’s foundational, billion-year-old environmental support system cannot be replaced. Once species are gone, they are gone forever. Driving research to better understand the species of our planet and their interactions within ecosystems. Providing conservation management leadership by mapping the species of our planet and identifying where we have the best opportunity to protect the most species. Engaging people everywhere to participate in caring for our planet and achieving the goal of Half-Earth. Building on cutting-edge science, analytics and technology, the Half-Earth Project is mapping the fine distribution of species across the globe to identify the places where we can protect the highest number of species. By determining which blocks of land and sea we can string together for maximum effect, we have the opportunity to support the most biodiverse places in the world as well as the people who call these paradises home. The Half-Earth Project Map is a high-resolution, dynamic world map and decision-support tool that guides where place-based species conservation activities are needed the most to save the bulk of Earth’s species, including humans. 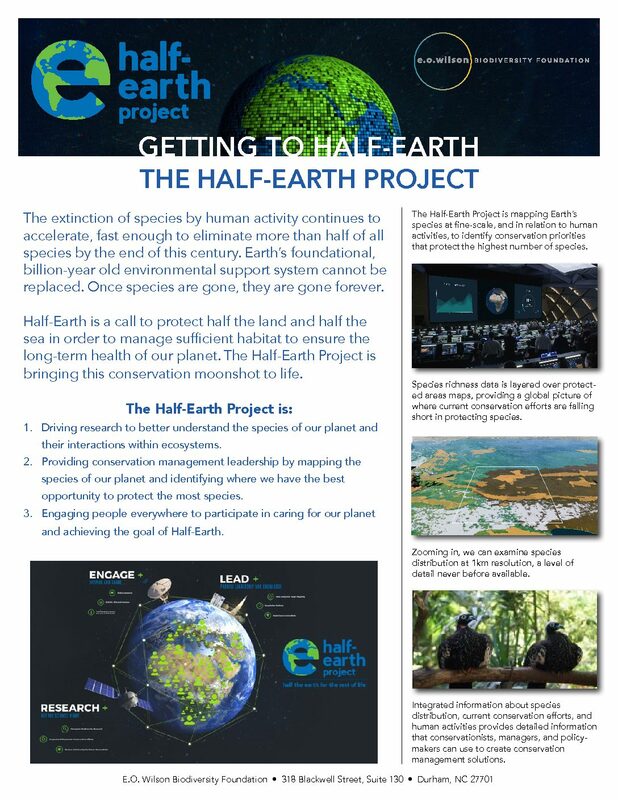 The Half-Earth Project Educator Ambassador program provides a platform for teachers to engage each other and their students in the grand ambition of Half-Earth, and to inspire and connect students with the natural world. We’re working to bottle the inspiration and create the tools to get everyone to Half-Earth. With the grand ambition of Half-Earth as a moonshot, we’re counting on Half-Earth Project Educator Ambassadors to lead the way, guiding their students to be out next generation stewards. Coming soon, the Half-Earth Chairs and Scholars program will support global biodiversity research and scholarship in an effort to cultivate and champion the unique insights and expertise of scientists from each region of the world and nurture a global footprint of scientific leadership in support of Half-Earth. On Half-Earth Day we celebrate the grand ambition of Half-Earth, showcase progress, and engage people in how they can participate in the Half-Earth Project. Half-Earth Day brings together scientists, indigenous and local community leaders, and global conservation and multinational organizations to share their voices and visions for how we can best care for our planet. 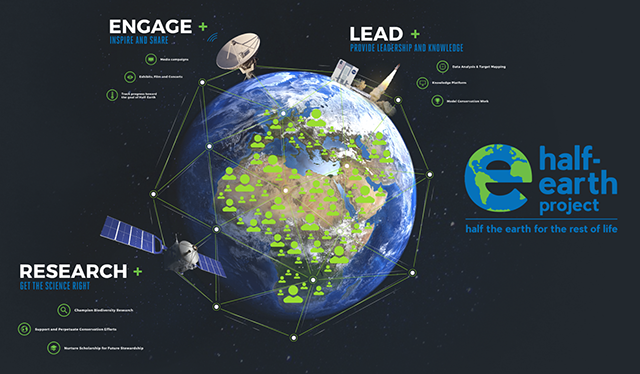 Visit half-earthproject.org for more information. Can we reach Half-Earth? We can if we want to.